As a golf purist, I accept that bad bounces like this are part of the game (and are equalled by the inordinate number of good/lucky bounces that I get). But I still couldn’t avoid grumbling at the Golf Gods, and wondering if there was a better way to place rakes on a course. There are many viewpoints across the country. At many clubs, the policy is for rakes to be placed in the centre/base of the bunker, pointed in (or parallel to) direction of play. Aaron Newnham, Director of Golf at Royal Melbourne, offers a similar viewpoint. 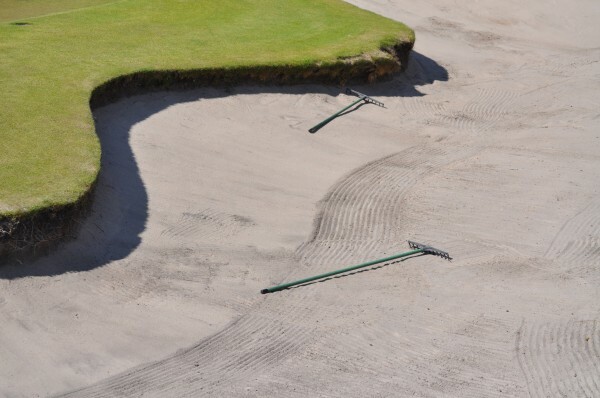 Other courses ask players to place rakes outside of the bunkers, either along the edge, or in a “strategic entry position”. “It may be argued that there is more likelihood of a ball being deflected into or kept out of a bunker if the rake is placed outside the bunker. It could also be argued that if the rake is in the bunker it is most unlikely that the ball will be deflected out of the bunker. 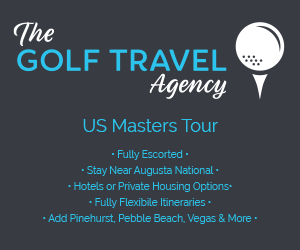 “Also, if a rake is in the middle of a large bunker it is either not used or the player is obliged to rake a large area of the bunker resulting in unnecessary delay. Perhaps we should borrow ideas from the US, where some courses have rakes attached to buggies, or with players carrying their own? In other courses, rakes are stored in vertical tubes that are sunken below ground level, so that only the tines are shown. Maybe we should all just take a page out of the book from courses like WA’s Secret Harbour, where bunkers are purposely NOT raked. If you get stuck into a bunker, you simply pick up your ball, wipe a nice lie in the sand, and place your ball. While this may bother the golf purist, this gives all players an equal chance, avoids those impossible “Footprint lies”, and eliminates the need (and costs) for rakes and bunker maintenance. It also speeds up play a bit, especially for the higher handicapper who has enough trouble escaping the sand at the best of times. Or, we could go the whole hog and heed the words of legend Peter Thomson, and simply not rake them at all, and transform bunkers into a real hazard. Because, after all, we shouldn’t be in there in the first place, right? One thing is certain: it is up to the members to do the right thing, and follow their club’s policy. What are your thoughts on the great rake debate? One Response to "The Great Rake Debate"